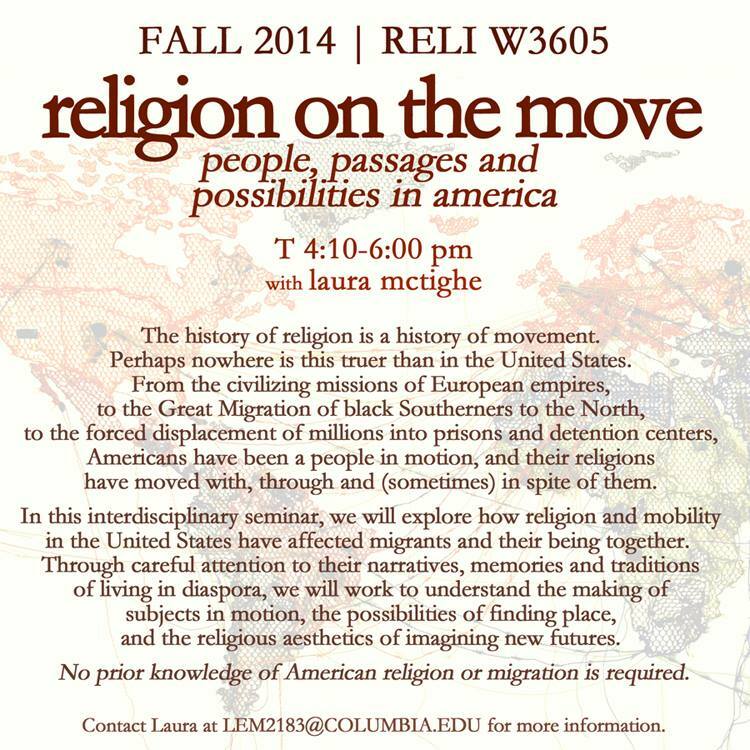 In the Fall of 2014, I will be teaching Religion on the Move: People, Passages and Possibilities in America. This interactive seminar uses – and teaches – historical, social scientific, and narrative methods to analyze religion on the move in America. Such theoretical complexity is foundational to the study of religion at Columbia University. While our department offers courses in many different geographic regions and religious traditions, we share a cross-cutting commitment to pushing beyond the things of religion (beliefs, relics and institutions) that have traditionally animated scholarly inquiries, and to examining instead the lived processes of religion through attention to time, transmission, place, body and media. Religion on the Move contributes a fresh perspective to current department course offerings, both for North American concentrators and for students University-wide. Our work together is divided into three core areas of inquiry: Narratives of Passage; People in Contact; and Possibilities of Movement. A theoretical and methodological introduction frames our semester’s work. We begin by asking how we should study the making of mass migrations (beyond push-pull framings) and the complexities of religion on the move (beyond framings of religion as a salve for coping with the shock of the new). We then turn to two narratives of traveling with Americans and practicing religion to consider how following the people changes our perspective on religion and mobility, as well as the types of questions we can ask. In Narratives of Passage, we explore the classic types of free/forced migration through the peopling North America by European empires in the colonial period; the Middle Passage of enslaved Africans from 1619 to 1808; and the forced expulsion of Native peoples through the Trail of Tears mandated by the Indian Removal Act of 1830. With each example, we consider how people’s religious formations and spiritual yearnings are re/made through different experiences of mobility. In People in Contact, we bring these single community narratives into conversation through an exploration of the making of the American Empire at home and abroad in 19th and 20th centuries. We begin with the mass influx of people from Irish, Jewish and Chinese diasporas in the antebellum and post-bellum periods, considering the complex reasons migrants left their home countries, the lives they built in contact, and the rise of anti-immigrant nativism. Next, we turn to “The West” as an imagined space of religious pluralism and possibility, and as a rapidly industrializing site of missionary control and social engineering. Finally, the two World Wars frame our discussion of the simultaneous protection of freedom abroad and curtailment of freedom at home, first through the 1924 immigration reforms and then through Japanese internment. These landmark policies are juxtaposed against coterminous flights from terror and trauma, first through the Black exodus from the Jim Crow South, and second through the post-Holocaust resettlement of Jewish communities. In Possibilities of Movement, we temper the celebratory mood of Civil Rights era immigration reform with a careful consideration of three major examples of forced, restricted and controlled movement: first, the fight for citizenship rights among undocumented workers; second, the struggles of belonging and recognition among the nation’s poor and mass-incarcerated; and third, the global exportation of American ideals of freedom and democracy through which the War on Terror became a War to Save Women. In each, we examine how religion is moved by, with and for people. We conclude the semester with a discussion of migration, diaspora and religion that flips many of our major course themes on their heads: the story of hundreds of African American men, women, and children from all walks of life who sold everything they owned, bought Sears and Roebuck tents, and left the United States for Liberia in 1967. They called themselves “Hebrew Israelites,” claiming that they were genealogical descendants of the ancient Israelites. With careful attention to their out-migration, settlement in the modern state of Israel and growth to a 5-continent diasporic community, we revisit our opening questions and theories about the making of subjects in motion, the possibilities of finding place, and the religious aesthetics of imagining new futures. Bailyn, Bernard. The Peopling of British North America: An Introduction. New York: Vintage, 1986. Abu-Lughod, Lila. Do Muslim Women Need Saving? Cambridge: Harvard University Press, 2013. Galvez, Alyshia. Guadalupe in New York: Devotion and the Struggle for Citizenship Rights among Mexican Migrants. New York: New York University Press, 2009. Hartman, Saidiya. Lose Your Mother: A Journey Along the Atlantic Slave Route. New York: Farrar, Straus and Giroux, 2007. Jackson, John. Thin Description: Ethnography and the African Hebrew Israelites of Jerusalem. Cambridge: Harvard University Press, 2013. Vargas, João H. Costa. Catching Hell in the City of Angels: Life and the Meaning of Blackness in Central Los Angeles. Minneapolis: University of Minnesota Press, 2006. Wallace, Anthony. The Long, Bitter Trail: Andrew Jackson and the Indians. New York: Farrar, Straus and Giroux, 1993.